Printed book manuals and online access manuals are available separately. We also offer Suzuki outboard parts. Seloc manual 1600 (book) covers 1988-2003 Suzuki outboard 2-225 HP, 1- to 3-cylinder, V4 & V6, 2-stroke engine models (including fuel injection and jet drives). 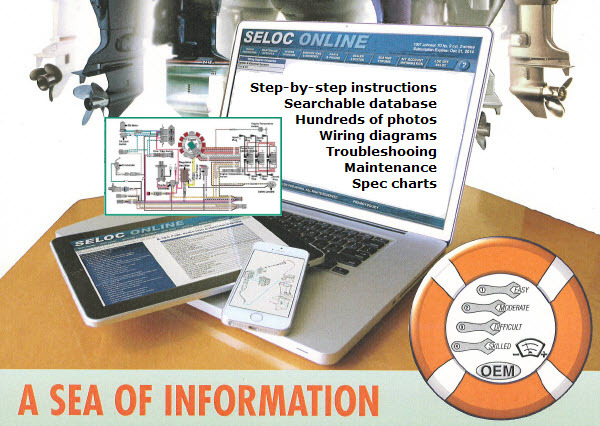 Seloc manual 1602 (book) covers 1996-2007 Suzuki outboard 2.5-300 HP, 4-stroke engine models (including jet drives). Purchase access to the online repair and maintenance manual for your specific Suzuki model for three years. You will choose your year and model during registration and will have access to that one model for the subscription period.